This March, the University of Louisville’s Cressman Center for Visual Arts is hosting work by the artist collective For Freedoms. The group is the first artist-run Super PAC (“Political Action Committee”), an organization that raises money in support for or against a political cause, but cannot directly support a candidate. As part of the Cressman Center’s “New Monuments” series, the exhibition will display For Freedoms’ Make America Great Again billboard, a large-scale work that superimposes the slogan from Donald Trump’s presidential campaign over a well-known image from the Selma, Alabama “Bloody Sunday” civil rights protest. This was one of many billboards that For Freedoms installed all over the US during the last presidential election (including in nearby Lexington, KY) in order to provoke conversations about art and political action. The work is part of a larger national campaign that investigates the relationship between art and speech, aesthetics and politics, and design and propaganda. “New Monuments” brings one monumental work of contemporary art to the Cressman space and provides contextual material to situate the work both in terms of its art historical origins and its current political context. For this iteration, the Cressman Center will be reimagined as a campaign headquarters—a space where participants organize before heading out into the field to campaign. This is, in many respects, the way that For Freedoms has operated in the last few years—as a base camp for instigating other artists into political conversations. The group has worked collaboratively with many artists and arts organizations. They have provided a Roy Stryker-esque prompt to photographers documenting America as part of the Postcards From America project, and provided the organizational conceit for a group exhibition at Jack Shainman gallery in 2017. For Freedoms has also held a residency at MoMA PS1 in 2017 and is currently working on a “50 States” project for the 2018 midterm elections. For Freedoms was founded by Hank Willis Thomas and Eric Gottesman, and now also includes a core team of five — Elizabeth Baribeau, Michelle Woo, Taylor Brock, Emma Nuzzo and Evan Blaise Walsh — and a growing network of over 140 contributing artists and hundreds of institutions nationwide. It takes its name from Franklin D. Roosevelt’s 1941 State of the Union address, a speech in which the president advocated against isolationism in favor of spreading American values to a European continent under threat of tyranny. In the speech, Roosevelt articulated the “Four Freedoms” essential to American liberty: Freedom of Speech, Freedom of Worship, Freedom from Want, and Freedom from Fear. Two years later, the speech inspired Norman Rockwell’s iconic “Four Freedoms” paintings, which were reproduced for the cover of the Saturday Evening Post. This oscillation between art and political speech provoked Thomas and Gottesman to think about the role of art making in our contemporary context—one in which “speech” is not limited to citizens and political actors but has been afforded to corporations and super PACs as well. 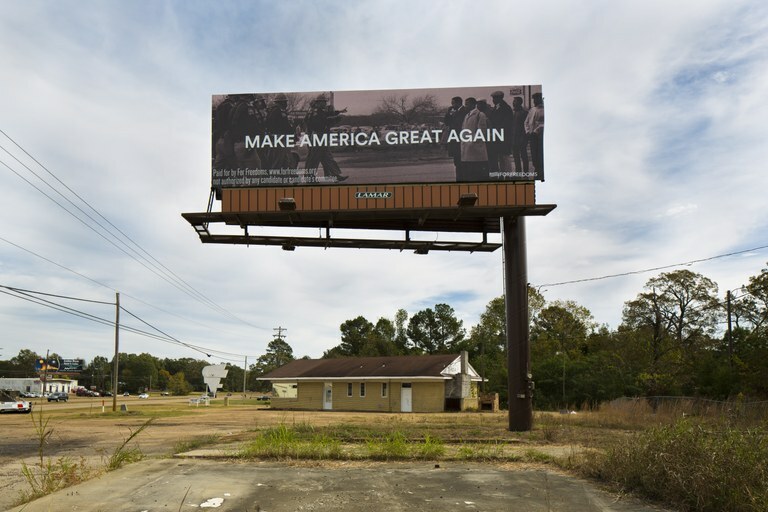 image: For Freedoms / Spider Martin, Make America Great Again - Pearl, Mississippi, 2016, vinyl billboard, 10.5ft x 36ft. Courtesy of For Freedoms.